I'm really liking the look of this industrial floor lamp which serves a dual function as a mini bookshelf. The sconce bookshelf is just one of my favorite pieces that adds the fun touch of a light fixture. And you just gotta love the corner pipe shelf that is such a smart use of space, not to mention an instant conversation piece. 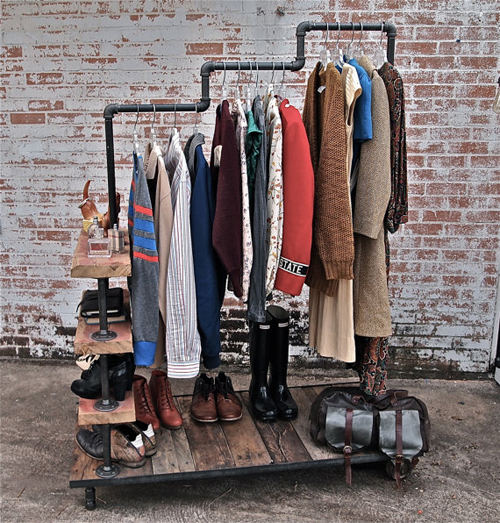 All of their garment racks are well crafted and a smart use of space. K and Andy will custom make one for you if you have preferred meansurements, just send them an email through their Etsy shop. After seeing their crafty bookshelf designs, I want to replace all of my boring shelves in my own house. I especially like the arrow shelf with lights, which would be a great addition to a bedroom or screened in porch.